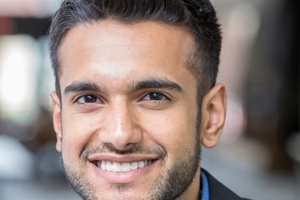 Salman Haji is the inaugural recipient of the Charles and Eleanor Iversen DC Scottish Rite Scholarship for graduate students in the School of International Service (SIS). When Haji heard the news, he was ecstatic. The DC Scottish Rite, an appendant body of Freemasonry, established the Charles and Eleanor Iversen DC Scottish Rite Scholarship to be awarded to SIS graduate students who demonstrate financial need. The endowed scholarship, which will provide $5,000 each year to an SIS graduate student, is named in honor of Charles Iversen, Sovereign Grand Inspector General Emeritus of the DC Scottish Rite, and in memory of Iversen’s wife Eleanor, who passed away in April. Award recipients will be chosen from a pool of qualified applicants at the discretion of the SIS Dean. The scholarship may be awarded either as a one time, non-renewable scholarship or offered as renewable from year to year, provided the student is enrolled at AU and meets the university’s eligibility requirements for scholarship assistance. Throughout his time at SIS, 2016 recipient Salman Haji has been a motivated and accomplished student, exemplifying SIS’s commitment to global service. He is attending AU as a Thomas R. Pickering Graduate Foreign Affairs Pickering Fellow, which has allowed him opportunities to intern at the U.S. Department of State in Washington, DC and at the U.S. Embassy in Dushanbe, Tajikistan. A dedicated student, Haji has also served as a Global Networks Program mentor, participated in dialogue groups through SIS Diversity and Inclusion, and will study abroad in Turkey this spring. Upon graduation, Haji will begin working for the Foreign Service as a Public Diplomacy-coned Officer. He hopes to focus his service efforts on the Middle East, North Africa and Central Asia. According to Haji, his experiences emigrating from Tanzania to the United States and being a first-generation student have driven him to succeed. But for a time, Haji was anxious that funding for his graduate education might not “fall together.” Worried about being able to afford his last semester, Haji contacted the SIS Graduate Admissions team, who reassured him that the school would do everything possible to help him pay for his remaining credits. Through this assistance, he was able to secure the funding he needed through the newly-established Charles and Eleanor Iversen DC Scottish Rite Scholarship. “At first, I did not think there was any funding available, so I was becoming very worried about how I could afford to finish my studies. Eventually, I heard that I had been chosen for an opportunity that had just opened up. I could not believe that the Charles and Eleanor Iversen DC Scottish Rite Scholarship had just been instituted and that I was the first recipient!” Haji said. Haji expressed thanks and gratitude to the DC Scottish Rite and SIS. Learn about financial aid opportunities at SIS.